Man has been eating barbecued or grilled poultry ever since he learned to pull the feathers off the birds. Before that, a bird cooked on an open fire with feathers was not real popular. We will define poultry as domestic birds -- chicken, turkey, duck, and even Cornish game hens. Wild birds are prepared in much the same manner, but may require a little marinade to tender them up a mite. 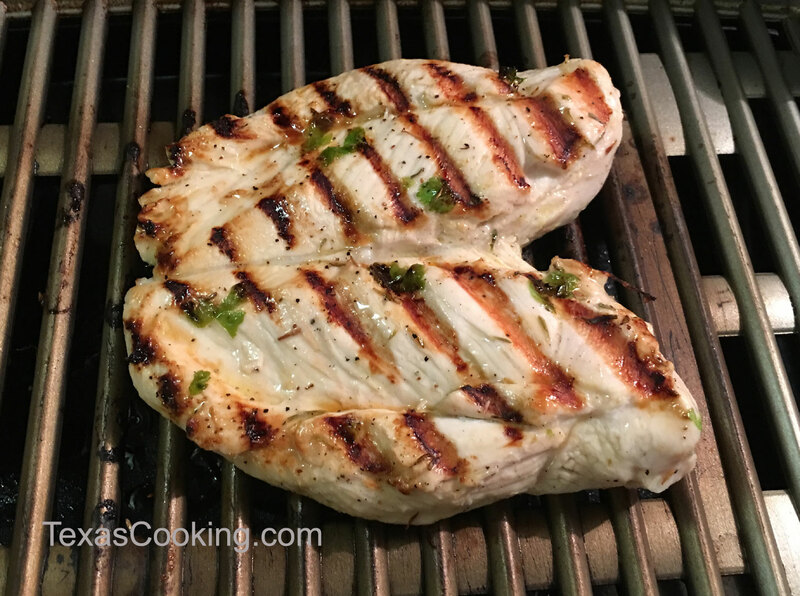 Basic barbecued/grilled chicken is a half bird on the grill, occasionally mopped with a little mop sauce as it cooks. A lot of chickens have gone to their reward in this way. When the barbecue cooking contest began to get popular, the thinkers and the innovators of the sport devoted some thought to poultry. The first major breakthrough in poultry preparation came when Cuzin Homer Page invented his "Cuzin Homer's Chicken Delights". The "Delights" are boned chicken thighs, wrapped in bacon and marinated in Homer's own sauce, then grilled until the bacon is a little crispy. This makes a delightful appetizer or main course for any occasion. Let's make a note right here to be very careful in your preparation of poultry. There have been some headlines lately about the possible dangers of eating poultry. It's not dangerous if you take care to observe the rules of the game. First of all, temperature. Store all poultry under 40 degrees F. And don't leave it sitting out on your drainboard during preparation. Cook it thoroughly; the meat thermometer says to cook poultry to an internal temperature of 185 degrees F. Next, is cleanliness. Clean up all your tools and cutting boards just as soon as you have finished with them. Observe these simple rules and you have nothing to worry about. The next advance in poultry preparation was the "Bird on a Throne". The inventor of this process is unknown at this time. "Bird on a Throne" makes use of the empty beer cans that seem to reproduce around barbecues. A whole frying-size chicken is seasoned as usual; then, a beer can, used, is filled with seasoned water and inserted into the bird's bottom to a depth that will allow the bird to sit upright resting on its legs and the beer can. The seasoned water boils or at least steams and cooks and seasons the bird from the inside. Works wonderful. Just requires a little headroom for the bird. When you try this method, you might want to season your water with onion powder, garlic powder, rosemary , black pepper and maybe a little sage, in proportions to taste. The latest method of grilling or barbecuing chicken just uses marinades and exotic sauces or glazes. Try any good marinade recommended for poultry. You might want to finish off your bird with some exotic sauce that is fruit flavored. In the Great Northwest, grilled chicken glazed with jalapeo pepper jelly has won a lot of barbecue contests. The other birds, turkey, duck and what have you, are dealt with in much the same manner as chicken. Just think of your turkey as a really big chicken. Your duck is a really fat chicken. Plan accordingly. Turkey can be cooked whole if you have a large enough pit. But don't try to cook the whole turkey with stuffing inside. There is a possibility that the dressing won't get hot enough fast enough to kill all the unhealthy things it might contain. You can insert an onion or apple into a whole bird to get some inside moisture and flavoring. If you have a Brinkman-type smoker with the water pan, just follow the directions for doing a whole turkey. You might want to get your butcher to cut your turkey in half down the breast if you have a smaller pit or just want half a turkey at a time. Makes it a lot easier to cook on a grill being you have half the thickness to cook. Do most of your cooking bone side down. Domestic duck is very fat. The best thing might be just to remove the breast and cook it. Cornish game hens can be cooked whole without a lot of bother due to their small size. Treat them just like you would chicken. We will at a later date try to find some words of wisdom for preparing wild game birds on the pit. There is a lot of fat in the skin of your poultry. There is also something in the skin that absorbs and retains flavor. So if you skin your poultry you are going to lose some of the flavor of the skin, but you will be removing a large portion of the fat content.. Decide for yourself. Remember, if you remove the skin, you will have to do a little more basting of the meat as the fat that would have done the job is gone. Use a little "healthy" oil in your mop sauce. Get a batch of skinned and boned chicken thighs. You can find them in most any supermarket. You will need about four for each serving. If you have big friends or friends with big appetites, you might want five or six per person. You might want to try wrapping a small section of pickled jalapeo pepper in the thighs as you roll them. Maybe a short section of green onion. The thighs are then cooked on a grill or in the pit. Myself, I prefer a rather hot fire on the grill, but you have to watch for flare-ups when the bacon starts to lose its fat. Cook the thighs until the bacon begins to crisp a little. The edges of the thigh will crisp a little too. Delicious. Make sure you have plenty of dipping sauce to serve with your delights. You can serve your delights as a main course or cut them into sections and skewer with a toothpick for appetizers. Good eating and keep 'em smoking.